I first published this blog four years ago this month. Its message is even more timely today. This is the season for resolutions and generosity. With all that is happening in our neighborhoods and the larger world, let’s revisit what each of us can do to help make things better. When I think about close community, the above photo comes to mind. 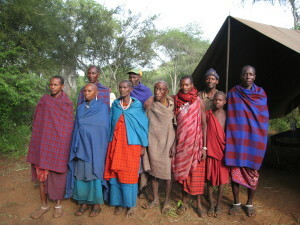 It is an African elder (in brown) surrounded by some members of his tribe. This photo was taken by Roberta Taylor six years ago when I joined a dozen Americans and one man from Brunei to study tribal life in Tanzania. While I don’t remember this man’s name, exact age or very much about him, I do know that he was at least 75 years old, and loved by his community. Over the past nine years I have been one of the December presenters at Leadership Philadelphia. This is a civic engagement/leadership development program led by my sister, Liz Dow. In my session I ask the participants to answer this question: “If today was your 75th birthday, and life had gone really well for you, what would people be thanking you for?” The Leadership Philadelphia program includes one full day’s immersion into a different civic theme each month over a ten month period. I tell each participant that one of the most important outcomes of these deep dives is to ultimately discover and pursue their next community calling. Each year I have these 120 for-profit and non-profit leaders do this exercise because their 75th birthday vision can help shape more immediate priorities and actions. Let me walk you through the process. Round 1 involves asking your three imagined 75th birthday guests what they would like to thank you for. These guests include one each from your personal, professional and community life. If you were in this class, what would each person be thanking you for? You now have some new tools and strategies for discovering and pursuing your next community calling and building your community legacy. Try the exercises I have suggested. Picture yourself in the center of your tribe as a wise, generous and beloved elder. Have a happy new year, and an especially happy 75th birthday!